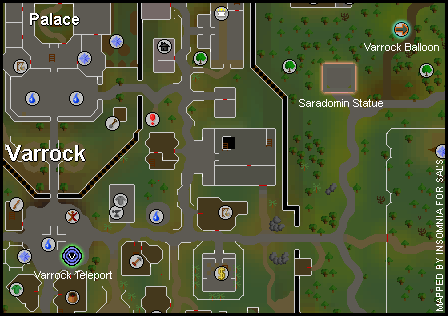 Begin by talking to Surok Magis by the Saradomin Statue near the sawmill. 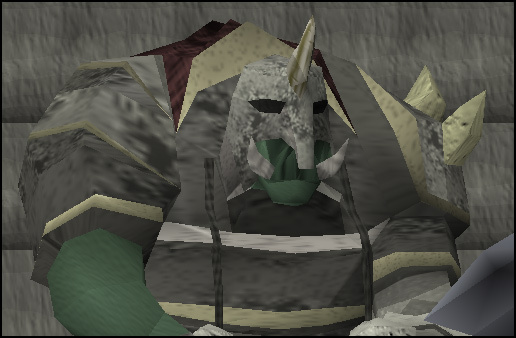 First, you should start by talking to Surok Magis near the Saradomin Statue. After a brief cutscene, follow Surok into the statue. Another cutscene will commence and follow him into the portal in the first western room. You should appear in the Chaos Tunnels. These tunnels are filled with dangerous monsters, so take only what you are prepared to lose. 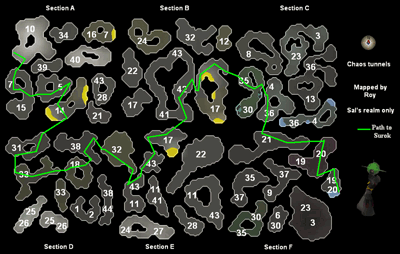 While you traverse these tunnels, look by the portals for footprints. This indicates you are going the right way. Not all portals have footprints by them though. 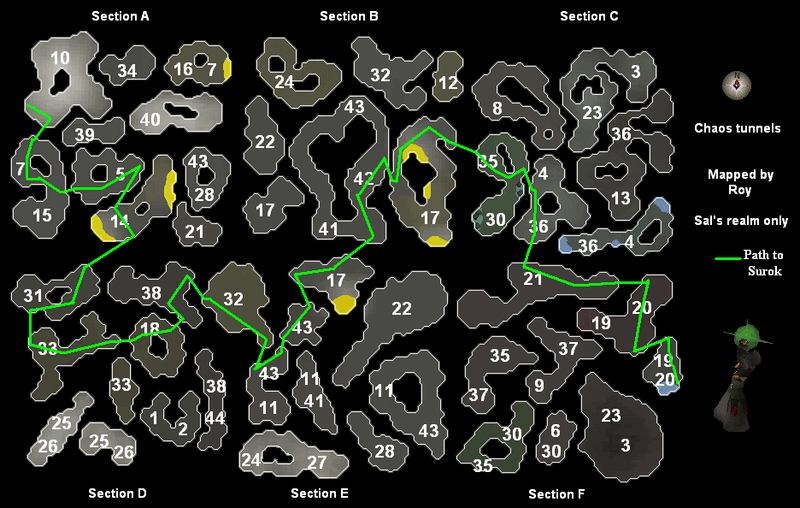 The following map reveals the path to Surok. Please refer to the below list of monster locations for further information. Surok will appear once and summon 2 Big Wolves. You do not need to kill these. Eventually you will come to a place where Surok is alone. Then, he will summon level 267 Bork. Bork is a very dangerous monster that only uses melee. Surok will be watching from afar while occasionally shooting magic that hits up to 25 on you. Dragonhide does not help in protection against his attacks. At about half health, Bork will summon 3-6 Ork Legions (level 70). Keep focusing on Bork and eat when Surok hits you. 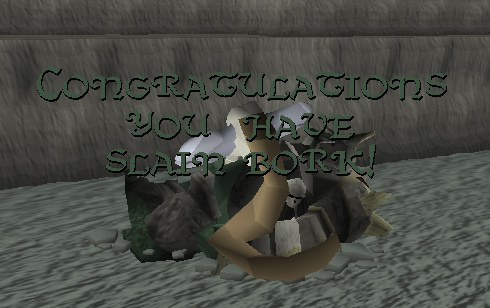 When Bork is dead, Surok will flee and the cave will begin to collapse. Pick up your drops from Bork and exit the cave. 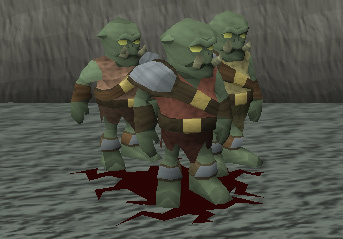 5 Blue charms 2-7 Crimson Charms 2-7 Green Charms 1 Sapphire 1 Emerald 1 Ruby 5,000 Slayer experience You can return to Bork's cave once a day to fight him again. You will receive 250 Slayer experience each additional time. There will also be a Dragonhai Monk there to hit you with magic every time after the first battle. [^] Talk to Surok Magis. [^] Follow Surok into the nearby statue. [^] Make your way through the Chaos Tunnels until you reach Surok. [^] Pick up the drops and leave the cave.